Grilled Cheese Sandwiches are a comfort food, something we have all grown up with and bring such joy to us as we remember those good times. A Baked Grilled Cheese Sandwich is no different, but yet it’s oh so good! Try this timeless classic twist and you will be hooked. I love the layers of cheese with the added bonus of fresh parmesan cheese sprinkled on top. Wow! Its a burst of flavor all the way through. So, so Good! 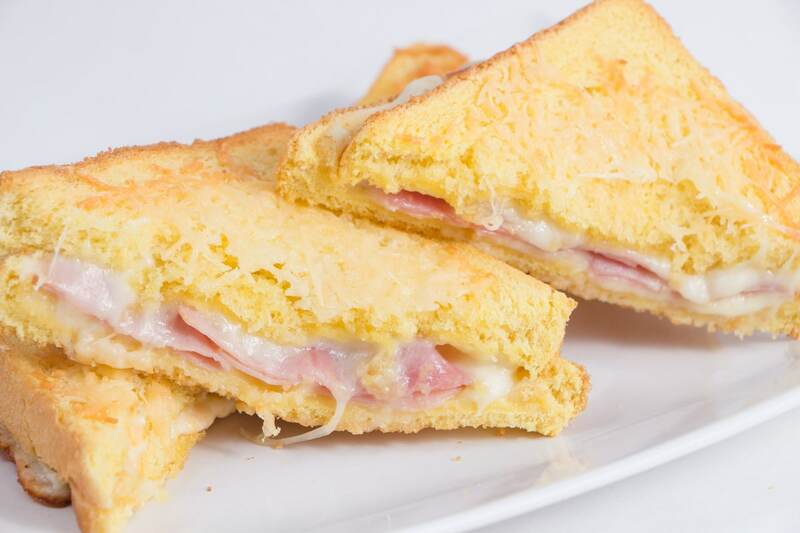 We love to make these on Texas Toast because of the thick pieces of bread, but the Baked Grilled Cheese could be made with any type of bread. Be creative and make what you like. Butter the outsides of each piece of bread (Top and bottom) . 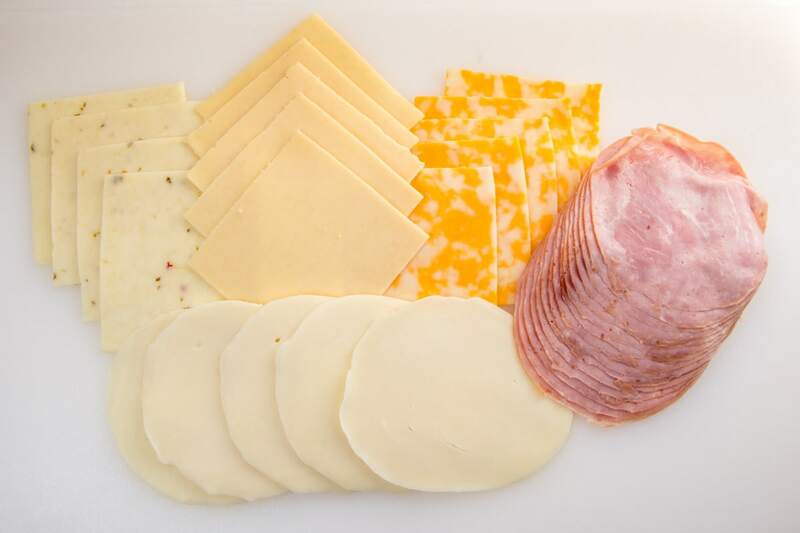 Then begin layering a piece of cheese with ham and then more cheese. I personally enjoy keeping the cheese next to the bread and any meat in the middle. It sort of holds it all together once it’s melted. But regardless how you put the Baked Grilled Cheese together, it will all taste the same! Have picky eaters? Don’t add what they don’t like! It’s really that simple. Add a few slices of their favorite cheeses and they will be thrilled. I tend to make a pan full of a variety of cheeses and meats and when it comes out, I slice everything in half and say “have at it!”. Everyone seems to get something they like and they all try something new too. I’s worked well for even my picky eater as he will try new things when it’s a free for all. I mean who wants to get left out when mom cooks, right? He sure doesn’t. My favorite part is the yummy crispy golden brown of the bottom of the bread. When it’s baked in all that butter, it’s an even golden brown and oh so good! 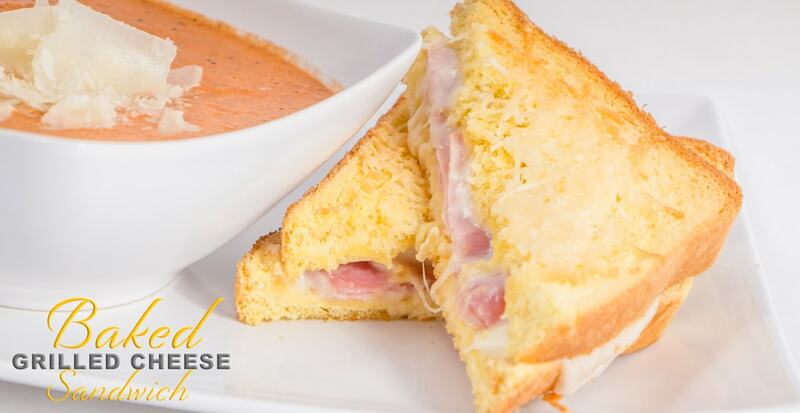 The top will be softer, but still a lightly toasted with the melted parmesan cheese and all the flavors and textures combine really take the Baked Grilled Cheese Sandwich up a notch. Delicious! I have noticed that I love these best when baked in a metal pan over a glass pan. It’s just something how the bottom crisps up! But good both ways. Plus in the time these little babies cook, I have time to clean up the kitchen and I can enjoy them when they come out of the oven. Yum! Recipes that compliment this recipe. Grilled Cheese Sandwiches are comfort food, now bake it and it will throw you over the top with a bottom buttery crusty texture and a top toasted to perfection with ooey gooey cheese. Yum! Make each sandwich to what you like. Use Ham, and multiple layers of cheese. I prefer to have the cheese next to the bread with the ham in the middle so the cheese melts and holds it all together. On top of each sandwich sprinkle with fresh shredded parmesan cheese. Oh it's a wonderful flavor additional. Trust me. Bake at 350F for 12-15 minutes. The top will become a light golden toasty brown with the fresh shredded parmesan cheese melted. Oh my gosh my mouth is watering! I love the idea of the parmesan on top! I love all the flavors of cheese and the parm on top is yummy too! 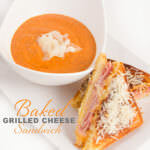 I never even thought to try baked grilled cheese – how brilliant! Sounds like a perfect meal for a winter afternoon inside with the kids. Definitely one of my favourite comfort foods. I love it with tomato soup. I am drooling. This looks amazing! If the recipe didn’t make my tummy rumble your pictures did! It looks amazing and I can’t wait to try it out! Aww..Thanks Tina! I hope you make it soon! This looks so delicious, I’ll have to add it to my list of recipes to try. Oh please do try it! They are wonderful! I never thought of sprinkle my cheese sandwich with some more cheese, but it sounds just great! The extra Parmesan is my favorite. Love the extra bite of flavor. YUM! I love the idea of baking a cheese sandwich! You just don’t have to manage it and risk burning it compared to a the stovetop method. I am also loving the addition of the parmesan to the outside of the bread! So smart! So true! It’s so easy to just make a bunch and they all come out perfect. Oh my goodness, this looks so good! And a great way to make a bunch of grilled cheese at once! Yum! I loved grilled cheese! These look so good, especially since it’s cold outside with some tomato soup. 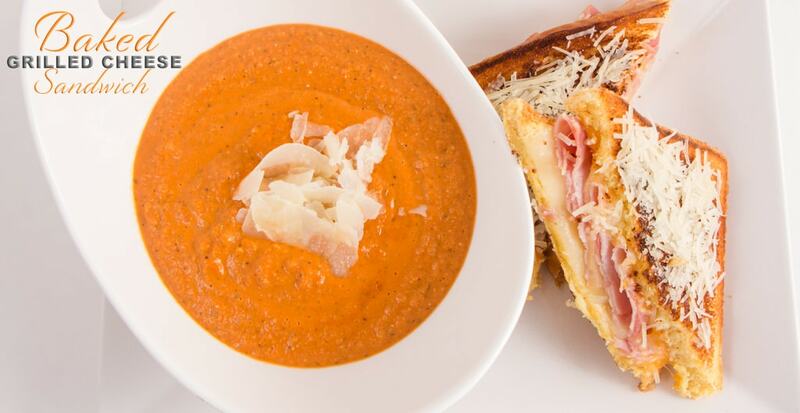 Making grilled cheese sandwich is a must when you are making tomato soup. We add ham or different meat sometimes but not always. We add ham sometimes too! It’s wonderful to dip into Tomato Soup! This looks absolutely delicious, like a perfect winter treat after playing outside in the snow or skiing all day. great website and easy to follow directions too! Oh! This would be heaven after a day of skiing! Delicious!